« Polly Pig for Prime Minister! At the time of writing, a recent TED presentation by Allan Savory with the title “How to green the desert and reverse climate change” had been viewed more than 700,000 times. At the end of the presentation, Savory received a standing ovation, and host Chris Anderson said, “I’m sure everyone here (a) has 100 questions and (b) wants to hug you”. The comment about a hug may have partially reflected some relief on the part of those present, based on a new belief that they could eat meat without contributing to massive climate change impacts and other environmental problems. Perhaps Anderson’s more pertinent comment was the one relating to 100 questions, because the audience and viewers would be well advised to consider the validity of Savory’s claims. What was Savory’s main point? Savory also refers to his process as “Holistic Resource Management” or HRM, and has previously referred to it as “short duration grazing”. How valid are Savory’s claims? Savory’s approach has been considered by two Australian researchers, Geoff Russell and Gerard Wedderburn-Bisshop. Geoff Russell is a mathematician, researcher and writer, and the author of “CSIRO Perfidy“. His work has been published in (amongst others) Australasian Science, The Monthly, Dissent, The Age, Punch, The Advertiser and Climate Spectator. He is also a regular contributor to Brave New Climate, the website of Professor Barry Brook, head of climate science at the University of Adelaide. Russell coined the term “boverty blues” to mean “the human impact of too many bovines overwhelming the local biosphere’s ability to feed them”. Very relevant to Savory’s focus on mimicking nature, Russell has pointed out that current livestock populations dwarf natural populations that preceded them. He states: “Wildlife rates of conception, growth, and the like don’t match what can be achieved by artificial selection, artificial insemination, good fences, irrigated feed production, predator extermination and all the other paraphernalia of modern agriculture. These have produced a totally unnatural and unprecedented explosion in numbers of those animals which people have designated as livestock.”  His table comparing numbers from the year 1500 with those from 2004 can be seen below. Today’s animals have also been bred to be much larger than they would be in nature, adding further to their total biomass and the related resource requirements. Gerard Wedderburn-Bisshop is a former Principal Scientist with the Queensland Government Department of Environment and Resources Management Remote Sensing Centre. He was responsible for assessing and monitoring vegetation cover, structure and trend across the state. This involved leading a team of remote sensing scientists to develop satellite monitoring methods to cover an area of 1.7 million square kilometres each year. He is currently a Director and Lead Scientist with the World Preservation Foundation and a researcher on Beyond Zero Emission’s Land Use Plan as part of its ZCA2020 project. The points that follow in italics are from his comments on the TED website in response to Savory’s presentation. What Savory does not mention is that intensive (cell) grazing is only viable where water points are close and labour is cheap. Temporary or permanent fencing is labour intensive, moving herds daily requires far more labour input than most operations can afford. Also absent is mention of the failure of traditional intensive grazing in Russia, Siberia, Mongolia, Kazakhstan, China and eastern Africa where large herds are constantly moved by traditional herders (as the Savory method does) – but sheer weight of livestock numbers has ravaged these landscapes in drought years, leading to more degradation. This has led to a dramatic long term deterioration of soils and native vegetation – see http://www.longpaddock.qld.gov.au/about/publications/pdf/preventingdegradation.pdf . Climate change – hotter, drier droughts, more flooding rains – will only accelerate the degradation of grazed rangelands. The best aspect of Savory’s method is that burning is stopped. 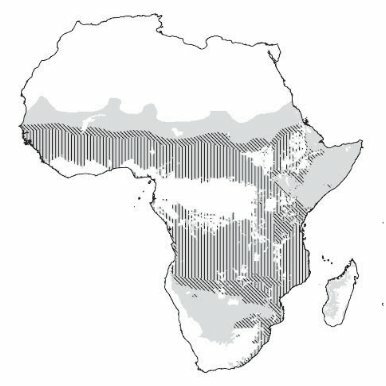 Burning is a very effective tool to stop forests re-growing, and half of Africa is high rainfall savannah, which will revert to forest if the burning were stopped – see http://www.nature.com/nature/journal/v478/n7369/full/nature10452.html. After a few years when herders see their grazing lands overtaken with trees, they will turn back to fire. ‘Conservation grazing’ – http://theconversation.edu.au/can-livestock-grazing-benefit-biodiversity-10789 does work in the more temperate regions where rainfall and feed production can support the cost of fencing, but is not a cure-all as is proposed. There is enormous potential in above ground and below ground carbon sequestration, but this will only happen when we stop burning the daylights out of grasslands for pasture management and to stop ‘woody weeds’; and when we remove grazing pressure. You can hear an interview with Wedderburn-Bisshop on these issues here. It’s from radio station 3CR’s “Freedom of Species” program, and was broadcast on 7th October, 2012. The podcast can be downloaded from this page. The interview was also referred to in my blog post “Omissions of Emissions: a critical climate change issue“. Savory’s methods have found little support from mainstream science. The [February 2000 issue of Rangelands] included an article by Jerry L. Holechek and others, which attempted to review the evidence for a number of Savory’s claims. Their review of studies from 13 North American sites and additional data from Africa found little evidence for any of the environmental benefits which Savory claimed for his methods. Moreover, the research consistently indicated that “hoof action from having a large number of animals on a small area for short time periods reduced rather than increased infiltration,” seemingly contradicting a key assumption of Savory’s methods. Holechek’s 2000 article also claims that Savory had “expressed doubt that holistic resource management could be validated experimentally.” While I was not able to find a precise reference for this claim, Savory did not deny it in his response, and elsewhere he has expressed some reservations about scientific testing. That is problematic because the scientific method is what will tell us whether Holistic Management works. Savory would like us to graze more cattle to fight desertification and climate change, even as scientific evidence indicates that his “solution” will actually exacerbate these problems. In a review of Savory’s 1988 book Holistic Resource Management, M.T. Hoffman wrote “The apparent inconsistencies and lack of definitions (eg. for concepts such as complexity, stability, resilience, diversity and production which have a number of different meanings in the ecological literature), render it frustratingly difficult to compare his [Holistic Resource Management] approach with the broader literature.” Imprecise language doesn’t just make it hard to compare Savory’s methods with the existing literature. It also makes it nearly impossible to evaluate his approach scientifically because it allows Savory to blame any failures on a misunderstanding of the method. All those referred to in this blog who have touched on the issue agree that the biosphere provides enormous potential for drawing down atmospheric carbon, and that the burning that occurs for pasture management needs to stop. Gerard Wedderburn-Bisshop (refer above) has made a similar point, citing another Nature article by Jonathan Foley and colleagues. A key difference between the alternative views is that Russell and Wedderburn-Bisshop have based theirs on peer-reviewed scientific literature, which is widely supported by other scientific sources. On the other hand (as indicated above), the scientific support for Savory’s approach appears scant. It has failed to convince many mainstream scientists of its truth. Much of it is not based on experiments that can be reproduced by others. It comes from an overconfident fringe expert. It uses imprecise vocabulary to form untested theories. Let’s hope that TED heeds Merberg’s call. Additional reference material will be inserted for the links contained in this article. It would be good to now mention the extensive ‘Grazed and Confused’ report, undertaken over 2 years by a large team of scientists from 5 universities and 4 research centers (who examined over 300 studies), published in late 2017 by the Food Climate Research Network and the University of Oxford: http://www.fcrn.org.uk/sites/default/files/project-files/fcrn_gnc_report.pdf with also a short video summary: https://www.youtube.com/watch?v=nub7pToY3jU . They confirm that in most situations the greenhouse gases produced by grazing livestock far outweigh any soil carbon sequestration obtained from ‘holistically’ managed grazing (thus debunking Savory’s main claim). They are currently working on a review of evidence around biodiversity. Longitudinally, (greater than 25 years) scientific research of Holistic Management practices (incorporating planned grazing) has been applied to our 8,500 acre granite grazing property in New England (Armidale, NSW, Australia). The University of New England’s PHD students have scientifically monitored, measured and assessed many aspects of change associated with planned grazing – change involving the water, mineral, plant and biodiversity cycles. Positive, comparative improvements have resulted across a range of landscape elements – (1) soil carbon (2) ground cover and regeneration (3) erosion (4) biodiversity. For land mangers, this translates to resilience in drought, flood and bushfire. But what about the bottom line? Concurrently, longitudinal records show marked increase in DSE & animal health; decrease in land/animal-related costs (by 40-60%) expenses normally associated with chemicals / machinery. Terrastendo – your scientific references are unbalanced and are out of date. With human health now scientifically, directly linked to soil health/animal nutrition – the science of proof is certainly catching up to and with Allan Savory’s theories. In the article, I cited former Queensland government principal scientist, Gerard Wedderburn-Bisshop (Department of Environment and Resources Management) stating that conservation grazing can work in the more temperate regions where rainfall and feed production can support the cost of fencing, but is not a cure-all as is proposed. Here’s a June 2016 paper by Maria Nordborg of EPOK – Centre for Organic Food & Farming at the Swedish University of Agricultural Sciences. The paper’s title is “Holistic management – a critical review of Allan Savory’s grazing method” (https://www.slu.se/globalassets/ew/org/centrb/epok/dokument/holisticmanagement_review.pdf). – There are 11 peer-reviewed studies on the effects of holistic grazing included in the Savory Institute research portfolio. Those case studies show positive effects of holistic grazing in terms of grassland and livestock productivity and soil conditions over conventional or continuous grazing, but are limited in time, number of study sites and analysed data. Only 6 of the studies use measurements while 5 are based on interviews or surveys. Further, the results are partially inconclusive, and the reported effects are in most cases small. – To date, no review study (not included in the research portfolios of the Savory Institute) has been able to demonstrate that holistic grazing is superior to conventional or continuous grazing. – Some claims concerning holistic grazing are directly at odds with scientific knowledge, e.g. the causes of land degradation and the relationship between cattle and atmospheric methane concentrations. – Improved grazing management on grasslands can store on average approximately 0.35 tonnes of C per ha and year – a rate seven times lower than the rate used by the Savory Institute to support the claim that holistic grazing can reverse climate change. – The total carbon storage potential in pastures does not exceed 0.8 tonnes of C per ha and year, or 27 billion tonnes of C globally, according to an estimate in this report based on very optimistic assumptions. 27 billion tonnes of C corresponds to less than 5% of the emissions of carbon since the beginning of the industrial revolution. Holistic grazing can thus not reverse climate change. With farming, I will take the word of someone on the ground over the word of someone at their keyboard every time. You appear to be at your keyboard more than on the ground. I know this post is over a year old, but, tawster is on target. Paul Mahoney you base a good bit of your argument on “satellite imagery” which you mention in your article and again in at least one comment. So you really think you can tell a lot about soil health and range health from satellite imagery? Like tawster I would challenge you and the anti-grazing “researchers” you quote to visit some farms and ranches that cell graze and cell graze well. Hell, come to my ranch. What area are you in? If you are too tunnel visioned to find some places to visit I will help. When you see a place that has been truly cell grazed for a number of years vs a place that has zero livestock vs a place that has been conventionally grazed there is absolutely no denying that cell grazing, when done properly, is one of the best things we can do for Mother Earth. Unfortunately, it is not as simple as doing “controlled experiments” and “research”. I guess that is due to how dynamic some of the environments are we graze in? It dang sure isn’t as simple as looking at satellite imagery. I was a conventional grazer my whole life. I will freely admit there are problems with the sustainability of conventional agriculture. Cell grazing is the only way I have found to take care of the land we have been entrusted with and feed the masses in a sustainable manner. Please get your “boots on the ground” and have a look for yourself before you discredit what many people have successfully done for years and what holds great promise for not only agriculture but the human race. Close mindedness will get us nowhere. There are far more efficient methods to obtain our nutritional requirements, and they’re the only ones that can do so on the scale required. The fact that we’re not focussing on them now is a key reason why there are over 800 million under-nourished people in the world. Sorry, I said I “was” a conventional grazer my whole life. Maybe I should have said we used to conventionally graze and now we cell graze. Funny you would focus on that instead of the fact that you cannot prove mob grazing or cell grazing does not work based off of satellite imagery. The simple fact is that WHEN DONE PROPERLY, cell grazing or mob grazing is one of the few ways to restore and improve soil biology. For whatever reason be it man made or from a natural disaster, these grazing principles are a tool to improve our environment. If you want to make a case for a vegan diet, preach against animal proteins and animal farming, point to a few of Allan Savory’s failed experiments, talk about some satellite imagery, be my guest. The bottom line is the principles Savory talks about work. In the real world, on big places, where water is not always in close proximity, on small places, in hot climates, in cold climates, wherever. I have seen it, lived it, breathed it. You have read and referenced some articles. Congratulations. My message would be that animal proteins are a necessary and effective part of the human diet and if we are going to continue to raise animals for human consumption let us do it in a way that improves the soil and grasslands in turn helping the environment. I’m assuming your message is that we shouldnt be raising animals for consumption to begin with? (If I’m wrong about that I apologize in advance) Why don’t you spend time making that case and outlining how that could be done and how you can convince the human race they really don’t like meat after all instead of attacking Savory and his life’s work? I apologize if I come across as rude . It is just frustrating when you have someone referencing a few articles and making claims against a practice they pretend to know about (judging by your comments and article you know less about mob grazing than I do about almond farming) meanwhile you know that this practice has so much to offer our industry and planet. An almond farmer can also include sheep, goats and hens in their practice, using Savorys methods. And, remember. Some types of agriculture will regenerate soil and some will slowly destroy it. The cost of destroying (degradetion) soil is not often taken into account. Along with dropping the waterlevel. Savorys methods build soil and increase the waterlevel. Monoculture soybean farming does not (as an example). Have you been to Joel Salatin’s Polyface Farm in VIrginia? I don’t know if you would call that Holistic Management, but it’s one beautiful farm. He moves his herd of cows every day using electric fencing. “Lovins also cited Polyface farm in the US as evidence that Savory’s approach works. But how successful is Polyface? * what were the comparative soil development figures? * what are in-ground carbon sequestration numbers? * what if you stack animals and plants (food plants, not just grass)? * what are the costs of removing grass to replace with food plants? “Tonnes of food” can be extremely misleading. For example, meat per pound is vastly more efficient as a food in compacted form. A ton of is a far less efficient food as a ton of . Even if meat per ton versus veggie per ton were truly comparable. “Production” is but one variable. Anyway… pastured animals are proven to be highly efficient instruments of regenerative agriculture. Combined with other forms of agriculture they can be even more powerful. But… on the whole, the methods he is suggesting (and the very similar models): Holistic Management, Mob-Stocking, Pasture-cropping… these actually work. And build soil. And reduce run-off. And push back desertification. I scratch my head at this. Folks are very successfully utilizing these models. And it is a coup for environmentalism. Sure, criticize any inflated claims. And, of course, there are certainly other ways of reclaiming land in a greenhouse friendly way. But this is one… and it works. And it demonstratively works. ” . . . these actually work”. Not on the scale required to feed the masses. What we are doing now, especially with row crops and factory farming, does not scale to feed the masses. Not for any length of time. Once the oil is gone. And once the soil is gone. The food is gone. And to build soil… you *have* to have animals on it. There is no alternative. None. Feeding the masses == population reduction. There is no way around it. But that is another discussion. 14 years of satellite imaging isn’t looking at the all those places that actually building soil then. Just go visit one of these farms that have been doing it for… oh, say a decade. The critics are simply wrong. And it is trivial to go out and see it for yourself. And you still end up with an ecological disaster of enormous magnitude. Factory farming applies to crop production as much as it applies to animal production. That 4 billion can be fed a number of ways, but if we don’t stop producing food (animal or vegetable) the way we are now… we can only feed those folks temporarily. As for animal feed. Everyone is in violent agreement that we should not be feeding grain to livestock. Especially livestock that should not be eating grain (cows). I think we can agree that everyone on this comment thread is against factory farming. That is not in dispute. Alas, the anti-livestock folks only trot out factory farming numbers. They never trot out numbers based on sustainable farming… cuz, then their arguements disintegrate. Alas, if you take all that land, and convert it to row crops for humans (or anyone / anything)… you still end up with the same unsustainable, ecologically destructive model that can only feed people (an malnurished diet mind you) temporarily. We have to end industrial farming. Again: Factory farming applies to how we raise crops as well as how we raise animals. Convert it back to something sustainable, ecologically sound, and far closer to what the land was used for originally — for example, grasslands and livestock — you can still feed all those people, the food is more nutritionally dense (and complete) per acre, and it is far FAR more environmentally sane. And requires… ZERO fossil fuels. But, we will not do that. We’ll keep planting soy, wheat and corn… and we’ll keep destroying the planet. Someone asked for examples of farms successfully using Savory’s techniques to build soil: Just google for a sustainable farm near you and ask them what practices they are using… and then ask to visit them. We have at least 3 or 4 using these techniques within 20 minutes drive of me. There is also a bunch of great videos of people doing this in practice all over the world. Anyway. You guys are convinced of whatever. But, I leave you to think about it. Go visit some truly sustainable farms (hint: you will not find one that doesn’t use animals in some capacity). Maybe even volunteer to work on one for a bit. Learn about agriculture. If the soil is not building, if you have to use artificial fertilizers, if you have to routinely use herbicides, fungicides or pesticides, and if you can’t drink the water flowing off the farm… It is not sustainable agriculture. It’s really that simple of a measuring stick. Now go think about what you are really eating. The figure of 4 billion is simply a measure of how many people could be fed from existing feedcrop and biofuel land. We wouldn’t use it all for crops to feed humans, as we only need enough to make up the current shortfall which causes around 1 billion to be under-nourished. On much of the remaining land, forest and other wooded vegetation that was there originally would be allowed to regenerate, drawing down significant amounts of carbon. James Hansen says we will not overcome climate change without massive reforestation. It’s part of the requirement for reaching the target of 350 ppm atmospheric CO2 that he and colleagues established after being asked for a figure by climate change campaigner Bill McKibben (https://terrastendo.net/2013/07/26/do-the-math-there-are-too-many-cows/). By all means, allow animals on farmland. 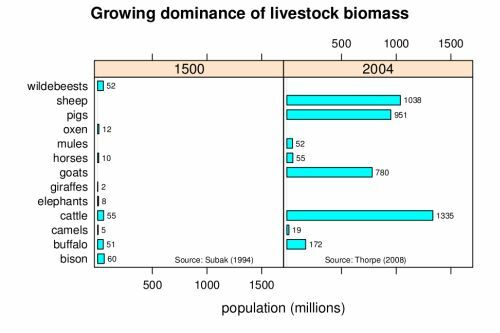 However, the numbers can be miniscule compared to the massive current livestock population. I don’t just talk about factory farming. Much of the ecological damage in Australia, for example, is caused by cattle and sheep grazing over the rangelands. They graze across 64% of the continent (https://terrastendo.net/2013/02/09/omissions-of-emissions-a-critical-climate-change-issue/). The damage from our 28 million cows is enormous. In the Savory article, I also mentioned some of the damage from grazing in Africa, where there are around 260 million. That damage is a major cause of hunger. The Hunger Halt program in Kenya is showing what can be achieved by moving away from livestock. Whether it’s grazing country or croplands, the grossly and inherently inefficient nature of animals as a food source causes us to use far more resources, including land, than would otherwise be required. You suggest some examples of where this is being done well. Could you post them here with any details needed to investigate or visit? Thanks Jules, I know you appreciate the seriousness of the situation and are contributing to the solution. Marvellous work Paul. Permission to post a link to this at TED, etc? Thanks Bruce, much appreciated. Please feel free to post links.